Amid declines in commuter rail service, fourteen state lawmakers are urging the MBTA to be more transparent about its fines against Keolis Commuter Services. 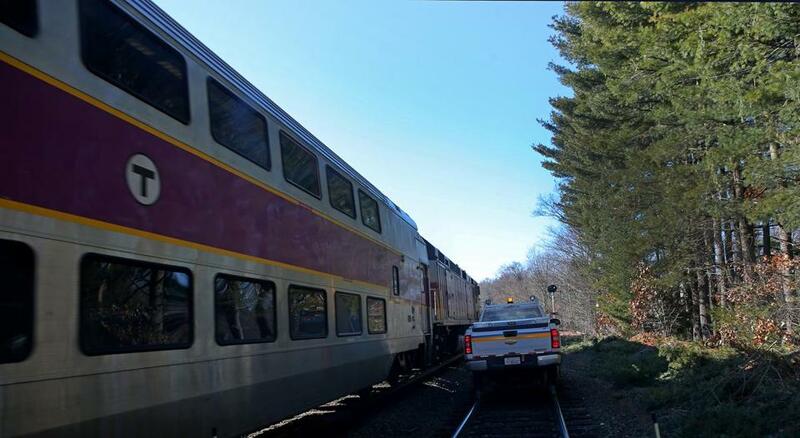 In an Oct. 31 letter to state Transportation Secretary Stephanie Pollack, the lawmakers, who represent districts with commuter rail service, lamented the unreliability of the service. “Many of us regularly receive calls and e-mails from constituents who report that scheduled trains are either cancelled or arrive after substantial delays, at which point, the delayed train is so overcrowded that those waiting are unable to board,” wrote the lawmakers, who included Senator Thomas M. McGee, co-chairman of the Legislature’s transportation committee. At one point, a staff member discovered that the 7:30, 8, and 8:30 a.m. Haverhill trains were canceled on one day, they wrote. “This is unacceptable and represents more than a mere inconvenience,” they wrote. State Senator Jamie Eldridge, a Democrat from Acton who signed the letter, said the agency’s handling of the Keolis contract — the largest public services contract in state history — is setting a bad precedent. “When governments let our companies get away with poor service, it sends the message that they don’t really have to do their jobs or improve the service they’re providing — and, respectfully, that’s what happened here,” he said. State Senator Kenneth Donnelly, who wrote the letter, said his constituents have been frustrated by the frequency of recent delays. “When you have a company that contracts with the state to provide service and they’re not providing it, I think the Legislature should know about that,” he said. In a recent update presented to the MBTA’s fiscal control board, Keolis officials acknowledged that North Station trains are experiencing more frequent delays. In April, about 95 percent arrived on time, but for October, about 86 percent did. For trains traveling through South Station, nearly 92 percent were on time in August, but that dropped to about 88 percent for October. The delays and cancellations have sparked frustration among commuters and politicians. After the Globe reported on the high number of cancellations on the Fairmount Line, which runs through diverse and low-income Boston neighborhoods, US Representative Michael Capuano called on the Federal Transit Administration to conduct a civil rights inquiry. Lawmakers have said their anger was compounded when they learned the MBTA, which oversees Keolis, had quietly paid back the company almost $840,000 in fines from the winter of 2015. The MBTA had not announced that it forgave the penalties, and the decision did not become public until a Globe report. Eldridge and other lawmakers had previously urged the state transportation department to have Keolis repay the forgiven fines, but officials defended their decision. In an Oct. 27 letter, John Englander, the general counsel for the MBTA and the state transportation department, said Keolis “presented a compelling case” that persuaded officials to forgive a portion of the fines. He acknowledged the MBTA could have chosen to disclose the decision. “The MBTA appreciates the legislative caucus’s input and feedback and will continue to hold Keolis accountable for cancelled trains and lagging on-time performance, including $14 million in fines since the contract began,” she wrote in an e-mail. She did not say whether the agency planned to change how it publicizes its fines against Keolis.